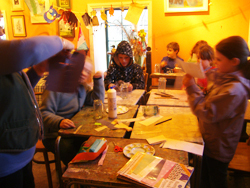 Classes for all ages are held in the bright, cosy and bohemian studio. In daytime and evening classes there is plenty of individual attention, at times with an eclectic mix of music for a soothing and inspiring atmosphere. Over these past years, the best creative times at Tin Jug Studio have been with children's art, craft and design classes, as well as costume and writing workshops during festivals. There are also occasional full-day art classes, in Spring/Summer, which include a home-cooked lunch at the studio. For beginners and intermediaries in Autumn/Winter, a series of evening classes for groups of five to seven people, with tuition by a working artist. Have you always wanted to do art but were discouraged as a child, or just afraid to try? Have you had an illness that makes you feel, 'I want to give art a try now'...You'll be delighted at finding your own abilities; individual or small group tuition helps you learn to see things differently; observe colour and beauty and texture; discover the joyful and simple ways to create your own works of art. Lose your fears, forget self-judgement. Find and acknowledge your own unique style! You can arrange for a morning, afternoon or evening, to suit. Art Tuition for one to three people in a single class, drawing still-life, or painting to music. This is a once-off class to get people started! It's a great gift to yourself, with no commitment to regular classes, in a calming an encouraging atmosphere. A local artist teaches a series of evening classes for a minimum of five, and up to seven people. with lots of individual attention! Watercolour/Oils/Acrylics. Returning art students bring their own paints, paper and brushes but the studio provides varied materials for total beginners. Ask for the TJS artists recommended getting started 'kits' of brushes, pads and paints (watercolours or acrylics). But no need to spend until you know you'll use them.. at least three times! "Delightful. It was like a weekend away in the country." "Wonderful! I feel like a child again." "You should call this 'A Day for the Senses' The art, food and music are a fabulous combination." Mobile: 00353 / (0) 87 668 1783 or send an email via Contact. Book in with a spouse of friend and save 10% on class fees! Vouchers for art tuition, classes or artworks. You are invited to give yourself the gift of relaxing time for art, or give that gift to someone you care for!